Jeffcoat appeared in 12 games in 2018, missing six games due to injury, but still managed to record five sacks, two forced fumbles and 21 defensive tackles. He was injured in the Labour Day Classic in Regina on September 2nd, and spent the next six weeks on injured-reserve before returning as a designated import for the final two weeks of the regular season. He was back to his dominant ways in the playoffs, registering two sacks in each of the club’s postseason games — the West Semi-Final win in Saskatchewan and the West Final loss in Calgary. Jeffcoat signed a two-year extension with the Bombers on January 21, 2019. 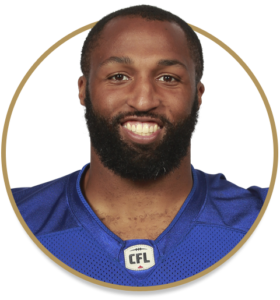 Jeffcoat dressed for 16 games as a CFL rookie, all starts and tied with with Jamaal Westerman for the team lead in quarterback sacks with seven. He led all Bombers defensive linemen in defensive plays with 77 – 36 tackles, three tackles on special teams, seven sacks, 23 quarterback pressures, one forced fumble, one interception, two pass knockdowns, one fumble recovery and three tackles for loss. His 23 QB pressures ranked fifth in the CFL. Jeffcoat posted a season-high four pressures on October 14 vs. B.C. and three pressures on two occasions – August 4 at Ottawa and August 12 in Hamilton. In the regular-season finale in Calgary he registered four tackles, two sacks and two pressures. Played his college ball at Texas and in 2013, his senior season, was a Consensus All-American, the Big 12 Conference Defensive Player of the Year and a First Team All-Big 12. Jeffcoat is the son of Dallas Cowboys legend Jim Jeffcoat. Entered the NFL in 2014 as an undrafted free agent with the Seattle Seahawks. Joined the Washington Redskins in September of 2014 and promoted to the active roster in October. Appeared in nine games, making one start, over the 2014-15 seasons with Washington and registered one sack, one interception and four tackles. Joined the Cleveland Browns in 2016, but did not see any action.